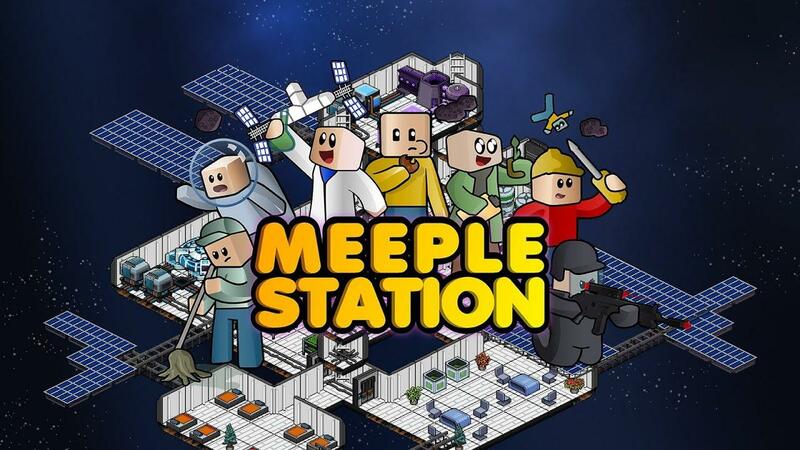 Meeple Station from Vox Games (Regions of Ruin) officially arrives on Steam today in Early Access, backed up by the new publisher Modularity from the folks behind Indie DB, Mod DB and most recently mod.io. I've had access to it for a little while now and I must say, I'm impressed at the rate they're churning out updates to it. Even so, the current status of the game is extremely rough and I'm being pretty kind here. The tutorial doesn't guide you very well to build a station, but thankfully at the click of a button it will build a random station design for you (which is actually pretty sweet). It's quite limited as it is right now, after an hour or two you've seen most of what it has to offer. I like the idea, I like the style (apart from the horrible UI) and they do seem to be going in a decent direction with it overall. It certainly has some similarities with Spacebase DF-9, hopefully it won't go the same way. It's promising though for sure, I have enjoyed the building aspect to it especially since you can build across Z-levels it opens up a lot of options. However, it would be better if it had camera rotation, as it can end up a little cramped. With the right amount of polish and more to do, it could be something great. I'm keen to see what people mod into it too. Their current plan is to remain in Early Access for 6-9 months. Find Meeple Station on Steam or itch.io. As for the new publisher, Modularity, they're going to be pushing for developers to use their mod.io service, a Steam Workshop-like service that works across platforms (including Linux). You can also find out more about Modularity here. It has been quite the journey to get here, juggling mod support, ensuring we have full cross-platform play, releasing our first game as publisher and making sure it’s all done to a level of quality we are proud of. Feels good! Running to the store to buy a $20 Steam bux so I can give bux for Tux. Seriously, Dwarf Fortress + Rimworld + Space = I was going to buy this as long as it was under $100. Sadly so far, i think it's bad and empty. Not much to build, GUI is terrible, controls are average at best, visual are cute but simple. And since last year when i first play it, it's not a lot of improvement. Not very confident for the future of this game, but hey, i like to be wrong. I rushed to buy it, it looks like my kind of game. After playing it I think it has a lot of promise. There are a few issues with the game as it stands, but it is early access so I was informed. The game is at least stable. There are some controls and UI issues which can be frustrating. There are also some layering issues (visually) with incoming traders. Be prepared for the personalities of the meeples to matter. I had a captain that was a jerk and chatty for my first game. He basically talked everyone into depression. I played a bit of this game a while back and I enjoyed it, though at the time not enough to make it a full series. I'm looking to make it a series again soon because it's right up my alley and at the time only needed a little bit more development.